I’m trying to think through this Franklin Graham situation that’s been filling my news feed and has been on mind for about a week now. In response to his comments was this Open Letter to Graham and now there’s reaction. I too, have a reaction. And I hope it’s Christian, charitable and best-case, adds perspective and is on the side of peace-making. In short, I feel that Graham missed an opportunity to contribute positively and for many, he worsened an already troubled situation. He is such a recognized figure in evangelical Christianity and I feel the need to begin at the obvious but still needs to be said, his Facebook statement is not a sufficient representation of all evangelicals, like me and many I know. At the same time, I am not trying to throw Franklin Graham under the bus. What he said was not scandalous; it was short on mercy. When considering the scope of his platform and our cultural tension, it’s fair to say this lacked the necessary discernment and consideration. 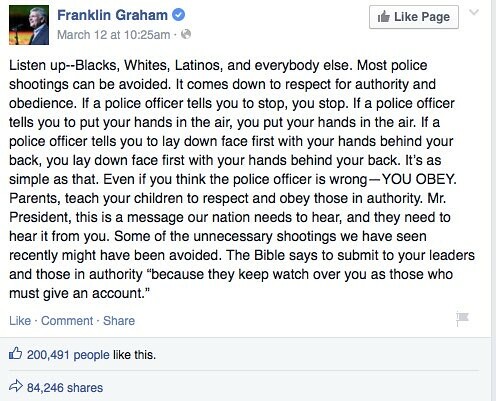 In addition to what Franklin said is the social media reaction of supporting Graham. Among them are those I regard as friends and/or have respect for. Again, I’m not looking for Graham to be punished or vilified, nor am I out to shame friends but I am taken back by all the “I stand/agree with Franklin” appearing on my various feeds. From my perspective, this is part of the culture-war that in short, is a no-win situation for any side. I do think at the very least, Graham could acknowledge the insensitivity made in his comments (one can still regard him as a man of God and also say he over-generalized, more on that below). As I have stressed in previous posts (like “Love Your Officer As You Love Your Protester and…”), I am among the many who are grateful for the brave men and women who serve in our police forces. I am also advocating for justice and the upholding of the American laws we have (like unnecessary use of force, innocent until proven guilty, fair-trials, just punishment, etc). This said, I feel a misunderstanding as it relates to justice-seekers: We/they are not trying to making criminal activity more convenient, but rather we are passionate/committed in making society fair, safe and just for everyone. I know these conversations are in the public square, I know many are saddened when a believer critiques another and so on. And while no one person can speak out on each and every issue, I feel compelled to continue to contribute to our cultural conversation on race and justice. “… Frankly, Rev. Graham, your insistence that “Blacks, Whites, Latinos, and everybody else” “Listen up,” was crude, insensitive, and paternalistic. Your comments betrayed the confidence that your brothers and sisters in Christ, especially those of color, have afforded your father’s ministry for decades. Your instructions oversimplified a complex and critical problem facing the nation and minimized the testimonies and wisdom of people of color and experts of every hue, including six police commissioners that served on the president’s task force on policing reform. It is not that simple … ” Please consider reading the rest here. Part of me wants to critique the various aspects of Graham’s statement (like entering any tense conversation with the words, “Listen up!”) and the follow-up letter but I’m going to attempt to take a big-pciture perspective here. While I am not crazy about the Open-Letter concept, as it is often over-used for the sole purpose of shaming, it actually feels appropriate in this case. Further, I recognize majority of the signers and regard them as God-honoring believers seeking to build the Kingdom of Jesus. Some will dismiss them as “liberal;” do so at your own peril. Just as I see the culture war as a poor investment in Kingdom energy, I also see these generalizations of conservative, liberal, right-wing, left-wing, etc. as generally unfruitful. The Kingdom of God is too big to limit our attention to only certain believers of specific tribes. Let us not shrink the Kingdom by categorically dismissing one another. The name Franklin Graham is loaded with different thoughts and feelings. For some, he is a saintly man who represents a fundamentalistic, Americanized, colonizing, highly moral Christianity. For others, he is among the few prophetic voices of an evangelical Christianity that is in its third act. For me, and perhaps others, he represents a Christian culture warrior, old-school religion that is not conversant with the much of the dialogue today. Further, and at the risk of offense, I’m still seeing a gospel of fire and brimstone as opposed to contributing the redemptive message. I’m saying this not to be provocative but to point out a distinction. Still, I am grateful for the work of Samaritan’s Purse (for Franklin’s role and the many diligent people serving in/through SP). If my understanding is accurate, it’s a lot more than shoe-boxes stuffed with dollar-store garbage and a $5 bill. If those shoeboxes are part of the vehicle that gets antiretroviral drugs to those fighting HIV (and the countless other needs), then the pragmatic side of me will comply. We’ll have to save the “When Helping Hurts” simple charity versus systemic sustainability conversation for another time but again, I am grateful for the work of Samaritan’s Purse. Back to the Open Letter. While I might have split-hairs on some word-choicing, the writers are spot on in that Franklin wrote insensitively and over-simplified a very complex, volatile issue. He failed to be sensitive to the hurt that is happening in the African American community. This is the big deal. How can a privileged white man from an amazing family, who has dedicated his life to serving others in the word and deed make such a statement? The answer is that he had a bad day, and should retract the statement, think through his next one, and engage in a redemptive conversation. I doubt Franklin Graham intended to cause any hurt, he was likely operating out of naïveté (which is perhaps more reason to get in dialogue with some of the signers of this letter). From the triteness of the Facebook post, it feels like he wrote this out of frustration and vented it out to the world. Obviously that’s an uninformed judgment call on my part, but I’d be even more troubled if that’s what a team of strategists and writers came up with. And here’s the dark side that I have not been able to shake (and I’d love to be wrong here). Though Graham will continue to lose influence in the culture-at-large, he will actually benefit in certain corners of the evangelical sub-culture. Part of my problem is that Franklin Graham (and his ministry) is rewarded every time he enters such a controversy, “calls the nation back to God,” or any time he makes a political or moral statement. He’s part of a symbolic fraternity that function as guardians of a “time we’d like to still have or return to.” This will strike some as ridiculous, but it’s these types of moments that keep certain names and organizations relevant. Exhibit A would be Pat Robertson. Let me be very clear here, I do not believe that everyone in this sub-culture agrees with Graham, hates, discriminates or is apathetic towards certain people groups, or is an uniformed Christian – my point above is that this is how it works. A recognized evangelical figure makes a traditional statement amidst a culture-war conversation and though there is culture backlash, there is reward as well. Again, I’d love to be wrong here but consider the observation and how we are playing into it. 1. Beware of the tendency to further a culture-war. Avoid the trap of “us versus them.” If you’d like to read up on the idea of the culture war then consider picking up the very readable Next Christians by Gabe Lyons. 2. The tendency to over-simplify everything. This is the best takeaway of the Open Letter. 3. As the Church, let us continue to be in prayer for all our citizens/strangers, for our officers, and for the pursuit of justice. May our communities be protected, may the violent be stopped and appropriately punished and may God magnify our efforts of transforming lives and bettering society (“on earth as it is in heaven”). 4. Finally and very importantly, let’s consider what it means to be mediators and peace-makers. As for Franklin Graham, perhaps the best-case scenario is to retract his statement, offer a deeper, more redemptive thought to “Blacks, Whites, Latinos, and everybody else,” and invest into the needed conversation of racial/societal reconciliation today. Thanks for this balanced view! I’ve struggled with this whole incident. Then, Franklin Graham took out a Twitter ad with the verse from Psalm 34:18 “The Lord is close to the broken hearted” which I thought was an interesting move considering his twitter feed as a whole is highly politicized and one sided. Do you think such an add sharing the image of a caring, merciful God would be constructive or just come across as an attempt to cover up the “drama” over his previous posts? i appreciate what Franklin Graham said. We worry all the time about being politically correct. He spoke the truth and was not offensive at all. It’s time everyone needs to follow the law. That is what our lives are governed by and that is what has made this country successful up, until the last couple generations when everyone wanted to make everyone feel ok with every single little thing said. Interesting about the ad but even as a recovering cynic, I’d like to think it was sincere and unrelated. What does bother me is the passive aggressive treatment towards the President. In one post/tweet there is criticism, then another expressing gratitude for calling for the release of Pastor Abedeni. I imagine in Franklin’s mind that sounds fair (“calling out the bad, praising the good”) but if you are serious about the cause, there are better ways to engage. It feels like too much posturing for his base. I think you’re asking a fair and honest question though Meg. Thanks for taking the time to read my post and comment. I don’t think those I am referring to are as concerned with being politically correct as they are about being just and sensitive. If I can push back a little, you make it sound like criminal activity is a relatively new American phenomena. I would imagine every society has sought for fewer criminals, less violence, and fair and just legislation, enforcement, and judicial systems, etc. American history would say that is a half-true and submit that America became “successful” also through the moral injustices of slave labor and the annexing of land. Still, don’t get me wrong, America rose to greatness because of among other things, ingenuity, hard work, fair laws (that clearly favored some above others). Which forces us to ask, could America have been even greater had the laws favored all its people and is it too late to continue pursuing that? In any case, be assured, no one I know is trying to make things easier for criminals, (I hope our brave and faithful officers arrest more of them regardless of color/ethnicity/belief/etc – I thank God for them, I pray for their protection and for their families) but that cannot come at the cost of injuring the innocent or unnecessary brutality. I hope that’s a helpful clarification, again, thanks for reading/commenting.